The observed changes in climate are already having wide-ranging impacts on ecosystems, the economy and on human health and well-being in Europe, according to the report ‘Climate change, impacts and vulnerability in Europe 2016’. New records continue to be set on global and European temperatures, sea levels and reduced sea ice in the Arctic. Precipitation patterns are changing, generally making wet regions in Europe wetter and dry regions drier. Glacier volume and snow cover are decreasing. At the same time, climate-related extremes such as heat waves, heavy precipitation and droughts, are increasing in frequency and intensity in many regions. 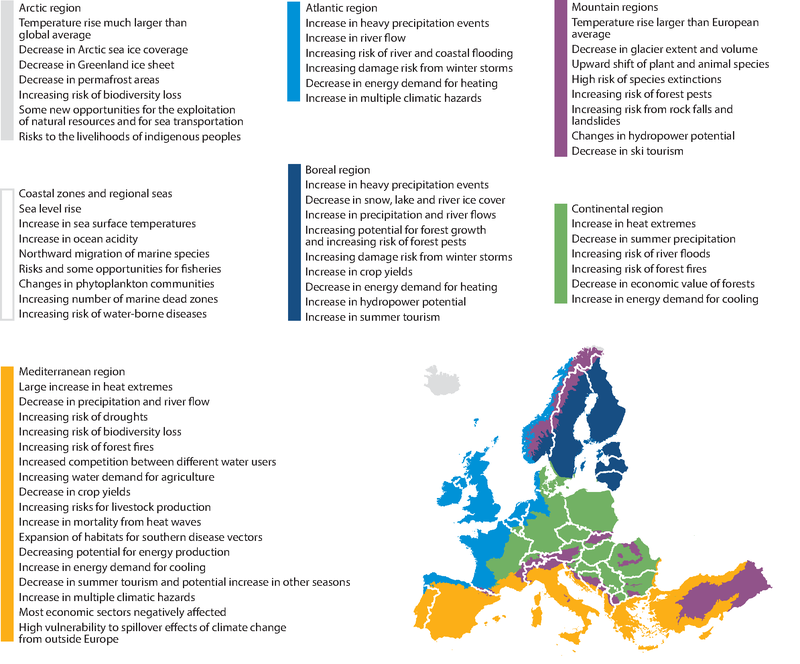 Improved climate projections provide further evidence that climate-related extremes will increase in many European regions. ‘Climate change will continue for many decades to come. The scale of future climate change and its impacts will depend on the effectiveness of implementing our global agreements to cut greenhouse gas emissions, but also ensuring that we have the right adaptation strategies and policies in place to reduce the risks from current and projected climate extremes,’ said Hans Bruyninckx, EEA Executive Director. All European regions are vulnerable to climate change, but some regions will experience more negative impacts than others. Southern and south-eastern Europe is projected to be a climate change hotspot, as it is expected to face the highest number of adverse impacts. This region is already experiencing large increases in heat extremes and decreases in precipitation and river flows, which have heightened the risk of more severe droughts, lower crop yields, biodiversity loss and forest fires. More frequent heat waves and changes in the distribution of climate-sensitive infectious diseases are expected to increase risks to human health and well-being. Coastal areas and floodplains in western parts of Europe are also seen as hotspots as they face an increased risk of flooding from rising sea levels and a possible increase in storm surges. Climate change is also leading to major changes in marine ecosystems as a result of ocean acidification, warming and the expansion of oxygen-depleted dead zones. Ecosystems and human activities in the Arctic will also be strongly affected owing to the particularly rapid increase in air and sea temperatures and the associated melting of land and sea ice. Although some regions may also experience some positive impacts, such as improving conditions for agriculture in parts of northern Europe, most regions and sectors will be negatively affected. Ecosystems and protected areas across Europe are under pressure from climate change and other stressors, such as land use change. The report highlights that the impacts of climate change are a threat to biodiversity at land and in the seas. Many animal and plant species are experiencing changes to their life cycles and are migrating northwards and to higher altitudes, while various invasive species have established themselves or have expanded their range. Marine species, including commercially important fish stocks, are also migrating northwards. These changes affect various ecosystem services and economic sectors such as agriculture, forestry and fisheries. The main health effects of climate change are linked to extreme weather events, changes in the distribution of climate-sensitive diseases, and changes in environmental and social conditions. River and coastal flooding has affected millions of people in Europe in the last decade. The health effects include injuries, infections, exposure to chemical hazards and mental health consequences. Heatwaves have become more frequent and intense, leading to tens of thousands of premature deaths in Europe. This trend is projected to increase and to intensify, unless appropriate adaptation measures are taken. The spread of tick species, the Asian tiger mosquito and other disease carriers increases the risk of Lyme disease, tick-borne encephalitis, West Nile fever, dengue, chikungunya and leishmaniasis. The economic costs of climate change can be very high. Climate-related extreme events in EEA member countries account for more than EUR 400 billion of economic losses since 1980. Available estimates of the future costs of climate change in Europe consider only some sectors and show considerable uncertainty. Still, the projected damage costs from climate change are highest in the Mediterranean region. Europe is also affected by climate change impacts occurring outside Europe through trade effects, infrastructure, geopolitical and security risks, and migration. Mainstreaming of climate change adaptation into other policies is progressing but can be further enhanced. Other possible further actions include improving policy coherence across different policy areas and governance levels (EU, transnational, national and subnational), more flexible adaptive management approaches, and the combination of technological solutions, ecosystem-based approaches and ‘soft’ measures. The development and use of climate and adaptation services are increasing in Europe. Improved knowledge would be useful in various areas, for example, on vulnerability and risk assessments at various scales and on monitoring, reporting and evaluation of adaptation actions, their costs and benefits, and synergies and trade-offs with other policies. The report is an indicator-based assessment of past and projected climate change and its impacts on ecosystems and society. It also looks at society’s vulnerability to these impacts and at the development of adaptation policies and the underlying knowledge base. The report was developed by the EEA in collaboration with the Joint Research Centre of the European Commission, the European Centre for Disease Prevention and Control, the World Health Organisation Regional Office for Europe and three European Topic Centres (ETC-CCA, ETC-BD, ETC-ICM). This is the fourth ‘Climate change, impacts and vulnerability in Europe’ report, which is published every four years. This edition aims to support the implementation and review process of the 2013 EU Adaptation Strategy, which is foreseen for 2018, and the development of national and transnational adaptation strategies and plans. For references, please go to https://www.eea.europa.eu/highlights/climate-change-poses-increasingly-severe or scan the QR code.